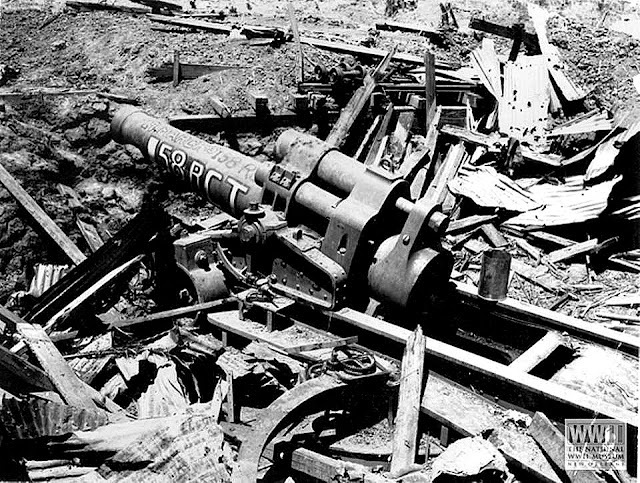 Lipa was practically reduced to rubble by American planes launched from the USS Hancock. Image credit: US Department of Defense, Wikipedia. Lipa after bombardment in WWII. Just ten hours1 after the treacherous attack on Pearl Harbor in December of 1941, as part of a well-coordinated attack, Japanese planes started raiding the Philippines to soften American defenses in preparation for an invasion. This invasion did not take long to follow; and by January of 1942, Japanese troops had started to move in to occupy the country. Because Gen. Douglas MacArthur’s ploy was to consolidate American defenses in Bataan, elsewhere, including in Batangas, the movement of the invading forces was virtually unopposed. Thus, until the return of Allied Forces in Luzon early in 1945, the towns of Batangas were under Japanese tyranny for more than three years. There were remote villages all over the province that Japanese troops did not reach; and those who could evacuated to these villages2. By and large, the occupying troops were resented by the local population, more so when news of the Allied landing in Leyte late in 1944 had reached Japanese troops in Luzon. Agitated, the Japanese started to commit countless atrocities against the civilian population in Batangas. The liberation of the province could not come soon enough. A United States Army document3 dated 1945 enumerated the dates when the towns and cities around the Philippines were liberated; and from this document we extract dates relevant to Batangas. The document annotated each date/town with these military terms: captured, held, occupied, seized and secured, all of which in practical terms simply meant that the towns were taken or close to being taken from the Japanese4. The Allied operations in Batangas involved a pincer or two-pronged assault, one arm moving out from Nasugbu southeast to the towns of Batangas and Lipa; while the other one moved east over Tagaytay into Santo Tomas and Tanauan. These two arms would close over Lipa and the Malepunyo mountain range. Because Japanese defenses were set elsewhere in anticipation of an Allied invasion from the south, the so-called Nasugbu landing was completed virtually unopposed. Allied troops from Nasugbu were still needed to clear Tagaytay of Japanese forces and support other US Army forces sweeping down from the landing at the Gulf of Lingayen, so the offensive to liberate Batangas would not commence until March5. The Verde Island passage was crucial to the movement of Allied ships to and from Luzon; and for the safe development of bases on the shores of Balayan and Batangas Bays. 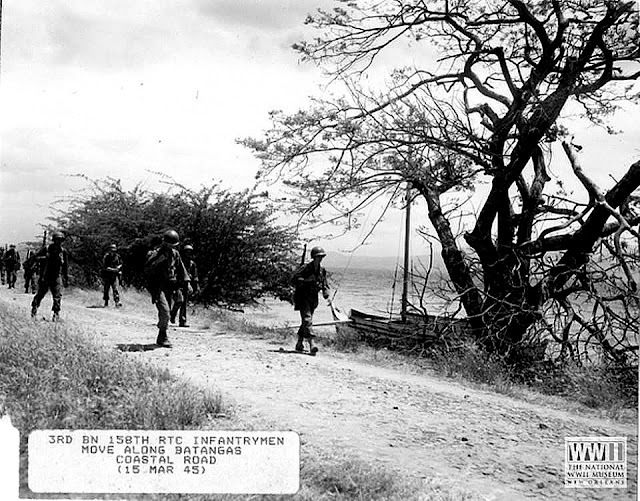 Verde Island itself (part of present-day Batangas City) was secured by the 19th and 21st Infantry on the 3rd of March. From Lemery, the 158th RCT drove on to Bauan, which was declared “Held” on 9 March. Mopping up operations had to be conducted for a few days to clear the Calumpang Peninsula – which separated the bays of Batangas and Balayan – of Japanese soldiers, so that Bauan was not considered “secured” until 12 March. The US Army source document listed this place under Batangas and stated that it was considered occupied by the 511th Parachute Infantry by 10 March. However, determining exactly which town Bukal belonged to provides a right proper conundrum. On the one hand, there is a barrio in present-day Batangas City called Bukal. On the other hand, the 511th was occupied with the northern arm of the pincer and was at around the date given assembled in a barrio called Real north of Santo Tomas. From Bauan, the 158th RCT went on to first occupy and then secure the capital town of Batangas. Resistance was relatively light since the Japanese so-called Fuji Force (so named after its commander Col. Masatoshi Fujishige) was better placed along the Calumpang Peninsula. The US Army document stated that Santo Tomas was “seized” by the 511th Parachute Infantry. This is contentious, however. According to a WWII book written by Robert Ross Smith, the Americans could not break through strong Japanese defenses on Mount Bijiang (part of the Makiling range near Santo Tomas) until AFTER 13 March. The same document further said that the town of Santo Tomas was likewise “seized” by the 7th Cavalry on 28 March. In contrast, Smith wrote that Santo Tomas was taken on 24 March by the 8th rather than the 7th Cavalry. 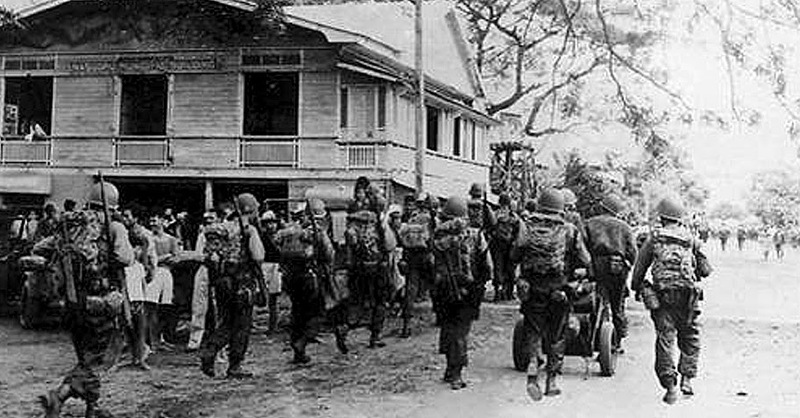 The US Army document stated that Talisay was secured on 14 March by the 511th Parachute Infantry. Smith’s version, however, was that it was the 187th Glider Infantry which descended from Tagaytay. The taking of Talisay was virtually unopposed because Japanese defenses were positioned two miles out from the town of Tanauan. While the towns along Balayan Bay had already been liberated earlier, mopping up operations conducted by the 158th RCT to finally secure the bay of pockets of Japanese resistance were likely not completed until 17 March. The town of Cuenca was seized by the 158th RCT on 20 March and declared captured the following day. This is not to say that Japanese defensive positions on Mt. Makulot had been overrun. This would, in fact, not be accomplished until late April. Tanauan was “seized” by the 1st Cavalry Division on 26 March. This was not without cost because both Tanauan and Santo Tomas were heavily defended by the Japanese. American forces, in fact, had to wait for reinforcements from the north before the push south into the two towns could be started. The US Army document listed Lipa as having been “seized” by the 1st Cavalry Division on 29 March. While Smith acknowledged that the capture of Lipa was, indeed, assigned to the 1st Cavalry, according to him it was, in fact, the 8th Cavalry which did so with little opposition. At any rate, just who did so probably did not really matter since Lipa was the converging point for troops moving in from two different directions to complete the pincer assault. After the liberation of Lipa, Japanese troops in Luzon were on the run and scattered but needed to be “mopped up.” The liberation of San Juan on 4 April by the F Company, 188th Infantry was part of these operations, which were also intended to clear the Bicol peninsula of Japanese troops. The US Army document stated that Sulac was “seized” by the 2nd Batallion of the 187th Infantry. This place is not a town but rather a barrio of Santo Tomas. Sulac was probably "sulok" or the northeastern corner of Lipa where it shares a boundary with Santo Tomas. Image credit: By Roel Balingit - File:PhlMapCit.svg by User:Felipe_Airaderivative work: User:Namayan, CC BY-SA 3.0, https://commons.wikimedia.org/w/index.php?curid=20785450. The US Army document stated that Mount Macolod (Makulot) was finally overrun on 20 April by the 11th Airborne Division. Allied forces had, in fact, completed the pincer assault at Lipa before returning back to Makulot, where the Fuji Force remained in position. For a more comprehensive discussion on the fighting at Mt. Makulot, read: The Fierce Battle for the Control of Cuenca and Mount Makulot in 1945. Mount Malepunyo is the mountain range due east of Lipa that is often erroneously referred to as Mount Malarayat. Japanese troops who fled from Lipa had sought refuge in the mountain and needed to be flushed out. The mountain was finally secured by the 11th Airborne Division on the first of May. Malepunyo is the mountain range people often erroneous refer to as Mt. Malarayat. 1 “Japanese occupation of the Philippines,” Wikipedia. 2 Barrio histories of Batangas showed that there were many remote villages in mountainous and forested areas that the Japanese troops did not venture into. 3 “List of Towns Liberated by the US Army from 17 October 1944 to 11 August 1945,” created 1945 by the Office of the AC/S for Intelligence, G2, United States Army Philippines-Ryukyus Command. 4 After consulting “Dictionary of Military Terms,” by Richard Bowyer, published 1999. 5 Along with many other details of this articles, from “US Army in World War II: The War in the Pacific, Triumph in the Philippines,” by Robert Ross Smith, online at Ibiblio.org. 6 An American trying to say “sulok” would have sounded more like “soo-lahk,” which probably explains why the place has been documented as Sulac or Sulak.